It's not often Vermonters get to view artwork by major contemporary women artists of the Middle East. A traveling exhibition of single works by 31 such artists, now on view at the Cathedral Church of St. Paul in Burlington, is an extraordinary opportunity to do just that. "I AM: Contemporary Middle Eastern Women Artists and the Quest to Build Peace" includes works by Arab and Persian artists who are Muslim or Christian. Seven are from Bahrain; the rest are from Jordan, Egypt, Lebanon, Iran, Palestine, Yemen, Morocco, Tunisia, United Arab Emirates, Iraq or Saudi Arabia. The range of mediums represented is gratifyingly diverse, from oil and acrylic paintings to photography, collage, ink on paper, digital prints, scanography, mixed media, sculpture and, in one case, human hair affixed to calf vellum. Some of the artists are based or were trained in the UK, the U.S. or Europe. High-end auction companies Christie's and Sotheby's represent a few of them, and nearly all have been exhibited and collected internationally. All the works are for sale, and these artists' integration in the global art market accounts for why the show would seem at home in any contemporary gallery in any major U.S. city. So, how did it end up on the concrete walls of St. Paul's, an Episcopal church? "I AM" is a peace-building project of Caravan, a nonprofit founded in Egypt in 2009 by Paul-Gordon Chandler, an American Episcopal priest. The son of a minister, he grew up in Senegal "surrounded by other faiths and art," Chandler said during a phone call, and was educated in Côte d'Ivoire and England. He launched Caravan during a 10-year posting in Cairo; its mission is to use the arts to unite people of different backgrounds and faiths in an effort to build sustainable peace. Caravan's art exhibition began as a citywide East-West arts festival in Cairo that continued annually until 2013, when president Mohamed Morsi was overthrown. That year's exhibition traveled to London while Caravan itself moved, with Chandler, to Chicago. Every Caravan exhibition since has also toured the U.S.
St. Paul's former dean and rector, the Very Reverend Jeanne Finan, who retired in October, had been following Chandler's work. She emailed him when she spotted an online call for venues for "I AM." Thus Burlington became the last — and smallest — stop on the tour of an exhibition that opened at the Jordan National Gallery of Fine Arts in Amman. Subsequent stops included St Martin-in-the-Fields in London and, in the U.S., American and Vanderbilt universities; the Center for the Arts in Jackson, Wy. ; and cathedrals in Cincinnati and Seattle. "I AM" is the nonprofit's first exhibition to focus on women and feature only Middle Eastern artists, rather than a mix of Eastern and Western ones. "I realized that the West's greatest stereotypes [concerning the Middle East] are of women," explained Chandler, who helped curator Janet Rady and a Caravan staff member choose the artworks. "The West often thinks of them as oppressed, exploited, unequal, in a continuous state of suffering. Of course, that exists — even in our own society," he pointed out. But the exhibition challenges such stereotypes by showing female artists who are "contemporary, engaged, active, dynamic and contribute significantly to the fabric of their own culture and our global culture." While many exhibitions of art from the Middle East "focus on the negative," Chandler continued, "this is really trying to be a celebration of [women's] strength and unique contribution toward making our world more harmonious." That positive focus has resulted in a selection of works that generally avoid provocation. For instance, while Lebanese artist Annie Kurkdjian's French-language home page features a painting of a genital mutilation in progress, her untitled piece in the exhibition depicts a woman's head propped against pillows with a quilt drawn to her chin. Only the greenish hues in the mixed-media piece hint at the subject's "agonizing," as Kurkdjian's statement calls it. Photographer Boushra Almutawakel, from Yemen, is known for her "Hijab/Veil" series, exploring the cultural and personal complexities of wearing a hijab. "I AM" includes a triptych from the series. The photographs show a woman veiled in layers of red, white and blue, with her hands in three different prayer positions associated with the three Abrahamic religions: palms up in Muslim prayer, pressed together in Christian worship and clasped in Jewish prayer. The work is labeled "Flag" online; it appears as "Untitled" in the show. Complexity of interpretation also characterizes Moroccan artist Lalla Essaydi's work. Her "Bullets Revisited #15" is part of a series that seeks to reclaim the exoticized images of Middle Eastern women promoted by 19th-century Western Orientalist artists such as Jean-August-Dominique Ingres and Eugène Delacroix. 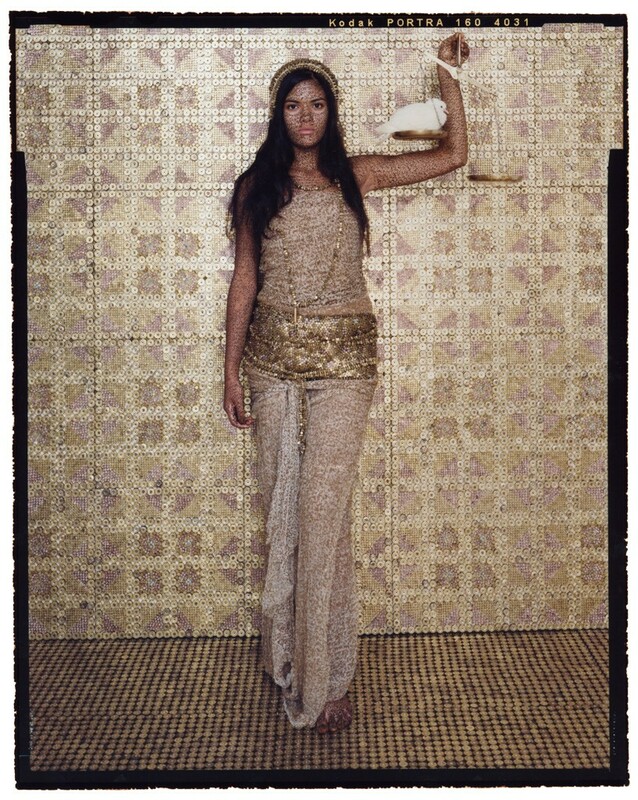 The chromogenic print shows a woman dressed in what appears to be richly embroidered gold against a gold-patterned wall and floor; all of the gold patterns, including the floor, the wall and the woman's clothing, are actually made from empty bullet casings. The model holds aloft a tipped scale containing a white bird in one pan and nothing in the other; ominously, the symbol of peace weighs less than the empty pan. Essaydi covered the exposed skin of her model with tiny Arabic writing. The tradition of Arabic calligraphy as art is evident in several more works in the exhibition, most notably "I Am You" by the Jordanian artist Wijdan. 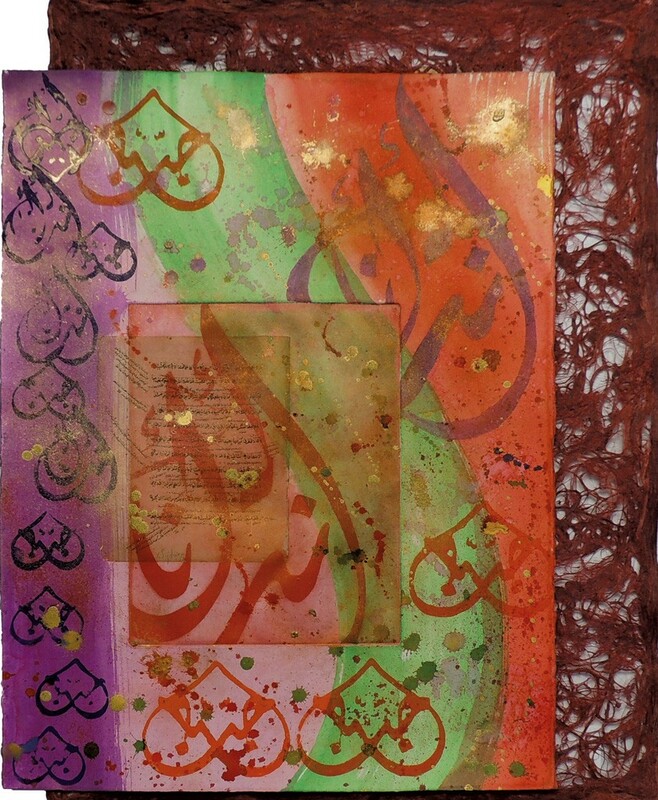 The mixed-media work incorporates a 1902 manuscript into a collaged composition in calligraphy. Though she doesn't translate the writing, Wijdan, an art historian, notes that it comes from Sufi idioms of devotion written on shrine banners. The calligraphic curves are echoed in the large bands of color uniting the composition. Each of these 31 works — ingeniously hung from a removable rail by congregant Greg Merhar — deserves close study in conjunction with a careful reading of the artist statement. What emerges from a viewing of "I AM" is a sense of the enormous diversity of aims and concerns of Middle Eastern women artists working today, and a desire to learn more. The original print version of this article was headlined "View From the East"